Editor’s note: The chader namaz is a large prayer scarf that covers the entire body. 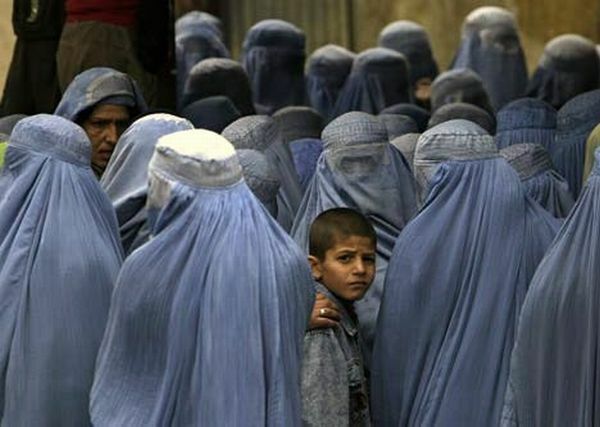 The burqa is not required under the present Afghan regime, but due to political instability as well as family and tribal custom, it is almost universally worn in the more conservative parts of the country, and women who might not otherwise be inclined to don it sometimes must do so for personal safety. Please scroll down for the Spanish and French translations. I try to be brave, show my presence. See me; don’t see me, but I am here. I don’t care how hot it is under burqa. I am part of my community. what I do under burqa. take my job, my life. to stay safe, continue my fight. enslaved in my generation of war. work today, still at risk. we are interesting, novel for them. our burqas are jail and safety made of fabric. Mi rostro escondido, sonríe, oculto. Esto soy yo, una mujer afgana, bajo el burqa. Intento ser valiente, mostrar mi existencia. Me ves, no me ves, pero estoy aquí. No me importa cuánto calor haga bajo el burqa. Soy parte de mi comunidad. Estoy aquí, una mujer afgana bajo el burqa Talibán. No puedo usar chader namaz1 – me reconocerían. Mi vida estaría amenazada si supieran lo que hago bajo el burqa. Me obligarán a dejar de trabajar, me quitarán mi trabajo, mi vida. Sí, soy valiente bajo el burqa, esclava en la generación de la guerra. Excluidas de la educación, mis hermanas analfabetas no pueden trabajar. Algunas escondidas, estudian en casa, a pesar del riesgo. Somos interesantes, algo nuevo para ellas. Estamos ocultas bajo una tela azul, confinadas, pero seguras. Soy una mujer afgana, trabajo bajo el burqa. Somos muchas. Y si hay una, todas somos afganas. Si Dios quiere, un día nos quitaremos el burqa. 1 * Chader namaz es un pañuelo de oración grande que cubre todo el cuerpo. El burqa no es obligatorio bajo el actual régimen afgano, pero debido a la inestabilidad política, así como por costumbre familiar y tribal, es común su uso en las zonas más conservadoras del país. Las mujeres quienes no tienen tendencia a llevarlo, a veces deben hacerlo por seguridad. Many thanks to an anonymous reader for translating Seeta’s poem into French. la femme afghane, sous une burqa. J’essaie d’être courageuse, de montrer ma présence. Tu me vois, tu ne me vois pas, mais je suis là. Je fais partie de ma communauté. ce que je fais sous ma burqa. prendront mon travail, ma vie. rester en sécurité, continuer ma lutte. esclave de ma génération en guerre. illettrees ne peuvent pas travailler. travaillent à ce jour, toujours en danger. nous les intéressons, nous sommes des nouveautés pour eux. nos burqas représentent une prison et une sécurité fabriquée en tissus. * Le chader namaz est une grande voile de prière qui recouvre entièrement le corps. La burqa n’est pas obligatoire selon le régime afghan en place actuellement, mais à cause de l’instabilité politique et des traditions familiales et tribales, elle est portée quasiment partout dans les endroits les plus conservateurs du pays, et les femmes qui, d’ordinaire, préféreraient ne pas la porter, le font parfois pour des raisons de sécurité personnelle. Such a haunting, powerful poem! You are indeed brave. So true. Those words are the sad glue that holds this very deep and touching poem together. Good job. I wish it didn’t have to be written. But it does. It has been a while since I visited the site and read your work, Seeta. I am so happy I stopped by and read this. Your description of the burqa as jail and safety — confined yet secure — is a clear and powerful statement to all of us. Your last line is perfect and I think anyone who reads this will always remember your words. Wonderful writing! Your poem brought tears to my eyes. My heart goes out to you in your struggle. You are brave women — you are our sisters — and please know that you are heard. Seeta – it is impossible to read your poem and NOT remember you. The burqa as both jail and safety is a powerful image, and one I won’t erase. You give me a taste of what it is as an Afghan woman to have the two faces of safety under the blue outer visible skin. I have traveled in Afghanistan and sometimes wished to be covered so as a foreigner I would not be stared at. I would like to read your poem when I show my photographs and talk about Afghanistan. My dear Seeta, Your poem was read to us in a gathering in NYC yesterday. Mostly women and a few teenage girls. We were all so moved. The teens were just as interested in your plight as the adults. You made me feel what your life is like and I thank you for sharing your life with us. It is important for us to hear from you. You are not forgotten. We are all thinking of you. We are listening. I look forward to reading your writing. Much love to you. Let me echo Michelle and Sarah: I, too, will always now think of the burqa in terms of both jail and safety. Thank you for sharing this wonderful work. Echoing Dawn, Barbara, and all of your other commenters as well! Seeta, this is my first time on this website, and so I am sad and happy at the same time. I am so happy that you are writing! You and others’ beautiful words and feelings keep you afloat, and keep us informed. As much as you feel alone, you are not! Keep writing, and writing, and writing. What a powerful piece of writing. Thank you. Inhsa’Allah. A powerfully worded poem, written by a strong woman with or without her burqa. You humble me. This is a beautiful poem and I hope that you are writing more of them. You are so strong and are certainly not forgotten. Much love to you. My eyes stoped and my heart raced when I saw your lines comparing “jail and safety”! You gave the translation, you meet the core of the significance of your feelings!! I can only be thankful for your courage!! Be brave always!!! My love to you!! I found this piece to be extremely moving. The juxtaposition of invisibility and community is striking here. I appreciate that you shared the emotion associated with having your picture taken by foreign women who could never understand what it means to wear burqa. I was particularly moved by the idea that what is done under burqa is unknown-the anonymity of it both jail and safety. Beautiful piece. Thank you for sharing it. Such truth and beauty in your poem! Thank you for sharing with everyone. I agree with others that your “jail and safety” imagery says so much and is so powerful. I can feel with you as you don your burqa, as your hold on to your bravery underneath it, how it keeps you safe, and how you long for the day when you no longer need it. “our burqas are jail and safety made of fabric” – like others who commented before me, I think this may be one of the most moving things I have ever read. It is both saddening and enlightening to read your account of what life is like as a woman in your country. I sense your oppression and opposition to this custom. At the same time, I marvel at how, conversely, you have found a way to turn the tables on this custom by using the burqa to hide your true emotions and expressions from this subjugation. Thank you for sharing your experience. As some of the other comments have said, I found your poem extremely moving. I can only imagine the strength it must take to face the same struggles day in and day out. I believe that the fact you are able to write about this shows how strong you truly are. Continue to write and tell your story. The more you are heard the more change you can make. I am Calvin, from California USA, and I currently attend Saint Mary’s College of California. Our English class as a whole discusses and replies to your letters with our own words and thoughts, and I am very impressed with your specific piece here. Under all that pressure from the political parties, family, and culture, I give you my utmost admire for being such an encouraging and brave model for the women in Afghan. Your pain is felt and the will to change the tradition is important, with your persistence and the help of other organizations, one day your goal will be reached, and the effort everyone puts into the movement will not be wasted. The way you described the Burqa was very moving, “our burqas are jail and safety made of fabric” , the contrasting perspectives in that sentence made me question the number of women who treat the Burqa as safety, or the amount of women that are only forced to wear the Burqa. Although it feels like a shelter made for the people in Afghan, the women under the scarves and fabric cloths are suffering emotionally and physically. For myself, in middle school, I was sheltered under my parents’ supervision all the time, although I knew they did it for my safety, but I felt trapped, and I was not allowed to go anywhere even if it was the weekend to go out with my friends. But comparing your situation to mine is incomparable, there is no question that your position is much tougher and time is the essence. I give you all my encouragement and all my heart to achieve your goal. Be able to free yourself from others, and live freely! I love this poem. It takes us beneath the burqa for just a moment. Thank YOU! I will be sharing this with a group of Burmese refugee girls I work with on Sunday nights. They are praying for you and your friends. Write to me in workshop 102! Congratulations on this excellent work. I am a fellow afghan woman living in UK. I totally admire this poem, so Powerful and moving. As your poem wishes a day that afghan women will be free of Burqa I hope and pray for that day.